Bishop Verot High School is a Catholic community of learning for young men and women sponsored by the Diocese of Venice, administered by a dedicated staff of Oblates of St. Francis de Sales and devout lay people, supported by parents and the priests and people of 22 Roman Catholic parishes in the Deanery. The philosophy of Bishop Verot identifies a religious purpose and an academic purpose. Both are interrelated. We believe the Christian commitment in service to God and neighbor is engendered by fostering the students' understanding of and respect for truth, which is evidenced in the teaching of Jesus Christ as proclaimed by the Roman Catholic Church, and by upholding democratic values in our Constitution and Declaration of Independence. The spirit of our patron, Saint Francis de Sales, in which our apostolate is carried out, is noted especially for the Christian values of charity, gentleness, and respect for the dignity, freedom, and uniqueness of each student, who is created in God’s image and blessed with gifts and talents to be nurtured and developed. In fulfilling our educational mission, we are concerned for the spiritual, intellectual, moral, physical, and social development of each student. By these efforts, we attempt to maintain standards of excellence in every school program in preparing students to meet the challenges of living a Christian life in the modern world. 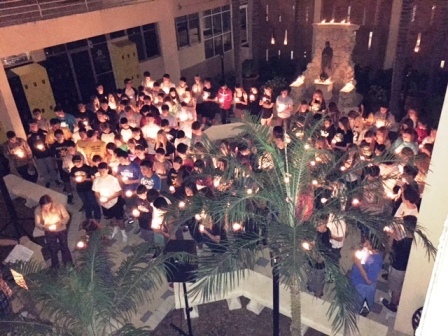 Bishop Verot High School is a Catholic faith community of learning, consisting of students, teachers, administrators, and staff, as well as parents, alumni, and benefactors, all sharing in the responsibility of advancing the mission of the school. The philosophy of Saint Francis de Sales is the basis for the identity of our school, emphasizing for all the daily importance of following Christ by practicing the Gospel virtues of gentleness, kindness, humility, and patience. Each person is created in God’s image, and therefore an atmosphere of mutual respect between students, faculty, and staff is vital to school life and the learning process. In addition to valuing academic achievement and co-curricular success, a fundamental priority of Bishop Verot is to challenge students to develop character and leadership skills and promote personal and spiritual growth. The Catholic mission and identity of Bishop Verot is cherished and valued while at the same time is respecting of the cultural and religious diversity within our community. The ultimate goal of an education at Bishop Verot is for students to be committed to lifelong growth and learning, inspired by faith to give of themselves for the betterment of others.